This script allows you to set a limit to the number of skills a hero may learn and keep for use in battles a la Pokemon but the menu looks and works in a different fashion. Actually, it looks more like any default menu than anything else. 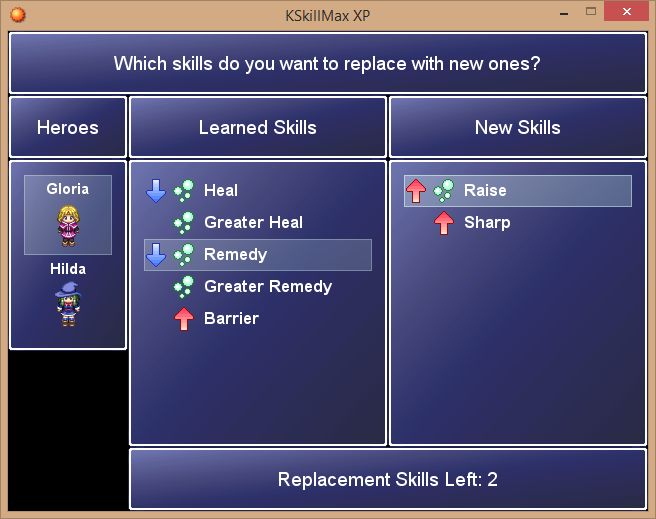 Besides the player may select which learned skills will be replaced with new ones IF the player ever wants any of them to be replaced. There's no problem if the player may prefer to replace just a few or even none of them. It's a Plug & Play script but it's still possible to change its settings by checking and editing most of the Constants found in KSkill module. Since version 1.1.0 you may count on 2 script calls to allow the heroes increase their skill limits if deemed necessary. I think that the method names included in those script calls make clear what they are supposed to do during gameplay. The catch is that every single time you use any of them the skill limit increases or decreases by that number. Make sure the skill limit never goes below the original skill limit nor it reaches zero. Designed for RPG Maker XP and VX. Free for use but not meant for commercial projects, but you can contact me if you still want to include it in your game. Due credit is not optional but a must. VERSION 1.1.0 IS AVAILABLE NOW! You may now increase or decrease the heroes skill limit during gameplay if deemed necessary. Otherwise never use both of the new script calls. VERSION 1.1.1 IS AVAILABLE NOW! For XP this would be a necessary maintenance version but you may notice that there's a new version available that was especially crafted for RPG Maker VX. VERSION 1.2.1 IS AVAILABLE NOW FOR RMXP ONLY! Game devs may not just limit how many skills a hero may learn automatically by setting up a limit from the beginning but he or she can also define if all those skills the hero didn't learn and discarded or ignored after closing the menu will be fully discarded by the system or not. This version also includes some bug fixes to make sure it won't crash if you open this menu and there is absolutely no pending skills to be learned. I've a great Idea since you asked me about Script requests or ideas, how about creating passive skills that could be combined with this script? With passive skills I mean, for example: If passive skill x is learned and applied, it will grant the User a certain state like regeneration or berserk. The user or hero is attached with a certain definable state. To the script: I really liked it, but there are some issues. I also want to use this script in a project but currently, there are some issues and I know this would require a great great edit. 1. Why do I get a error on line 254: it says undefined method error 'clear' for nil:Class. I get it on various things. 2. Could you edit the script in a way where some skills who are stronger cost more than 1 space? I mean, a player could easily take the best skills and leave the rest. It would balance the script more. In point 3 I'll talk more about that. 3. Also, im not really a fan of those replacement skills left points. I really dont get it. In my opinion, it should be like this: The amount of skill that can be taken should be linked to the lvl of the player or should be defined by the player lvl. A player can change the skills anytime he wants, unlimited without needing changing points. For example until lvl 5 Actor can "wear" 2 skills. Until lvl 20 he can wear 5 skills. At max lvl, until lvl 99 he can wear 25 skills. That all should be defineable. Also, I'd rather have a system where the different skills are counted differently. Stronger Skills should "weight" more than 1 space. I would like to see a system where a skill can have a weight. Like, we said, actor 1 is lvl 99 and he can wear 25 skills. But 10 of his skills that he took count as 2 and the rest counts as just 1. So he has only 15 skills despite the fact that he can have 25 because some skills "weight" more. Each actor should have its own weight. It seems to me that the replacement skills point count for everyone. 4. Also Instead of the window showing the replacement skill point left it should show how much "weight" the current actor has and the limit. 5. How about some infos on the current skill? Its hard for a player to choose the right skills if theres no info of the current skill that hes selecting. How about creating a mechanism where, you can press Z on a current skill and it shows information on it, like ATK, Cost, the text etc. Thanks, I know this is much. This is the kind of script that you didn't think you needed until you came accross it lol. First I would need to know what are you doing with great precision whenever you get that error message, Noctis. Then I would also appreciate if you let me know about other scripts you may have included in your project that may modify or touch stuff like skills or shops that might also include skills. That way I would be able to work on it by replicating the error and finding the root cause. So far the only thing I can tell for certain is that it might be an Array or a Hash that suddenly disappeared and couldn't be cleared mainly because it doesn't exist anymore. If you don't like the skill points stuff it's fine, it might not be suited for everybody I guess, the idea behind it was to limit the times a player can change a character's skills forcing him or her to pick wisely or suffer if they made a mistake. It was supposed to limit the total amount of skills a hero could get during gameplay, something slightly similar to what you may find in games like Pokemon and others the like. There you might only have a chance or two to get rid of useless or weak skills or to get a good one that's almost impossible to get any other way. @"Number 4": Well, it's a pain you might know where to implement it for sure, but it might be an interesting modification. That would mean it would be a separate version of my script. Let's call my current version Kiwi and see your vision of it as Maracuyá. Still, I don't get why a skill would even have a weight at all, I mean, we all know stuff like keys will never weight as much as a laptop nor need the same space once inside a single bag, but how would skills accomplish such unbelievable feat? Mmm, about number 5 I might say it's possible that I could include that info window in both versions, XP and VX. I updated the XP script hoping this minor fix will deal with your issue, Noctis. Still, it is not supposed to happen so I'd love to get more info about it. I also updated the VX script and it has reached version 1.2.0 already. Well, I'm just here to tell you that I have updated the XP version of my script, it has reached version 1.2.8 already. The changes included in this version would be the two new windows that will let you read all that's deemed necessary about the currently selected skill. Thus I hope the player will get a chance to make a wise decision whenever it's necessary to replace old skills. (11-17-2016, 12:01 AM)kyonides Wrote: First I would need to know what are you doing with great precision whenever you get that error message, Noctis. Then I would also appreciate if you let me know about other scripts you may have included in your project that may modify or touch stuff like skills or shops that might also include skills. That way I would be able to work on it by replicating the error and finding the root cause. So far the only thing I can tell for certain is that it might be an Array or a Hash that suddenly disappeared and couldn't be cleared mainly because it doesn't exist anymore. Thanks, your edit already fixed the bug as far I tested it now. It came on various things. For example if I talked to the women first without talking to the other NPCS. etc. Or If I went to the guy in the middle first and pressed "No changes". But it doesnt happen now. And I did not include any other scripts. Just tested yours. Now to your edit. Your edit is fine. But I can only press Z on Learned skills, not on New skills. Can you also make it possible to press Z on new Skills. How about also including the Information text of each skill to the information window? Now to what I said about the edits and your reply. Dont understand me wrong: I actually like the Idea of your script and I even want to use it, I just dont like the way it was handled. The reason why I want the amount of skills a actor tan take to be bound with a actors lvl is pretty simple. A player should choose wisely his skills and he should be able to change thme anytime. Also, some skills tend to be more stronger than others. A player could just pick the best skills and the leave the rest out. This is why I want the skills to have different weight. Well its up to you anyway. Btw. Are you going to work on that or at least give it some thought? Nope, I do think it's unnecessary complicated to change it to a weight oriented mechanism mainly because I still think they're intangible unlike common stuff like potions or armors. I know for sure that people will pick the strongest spells or techniques at once, and that was one of the purposes why my script was created. 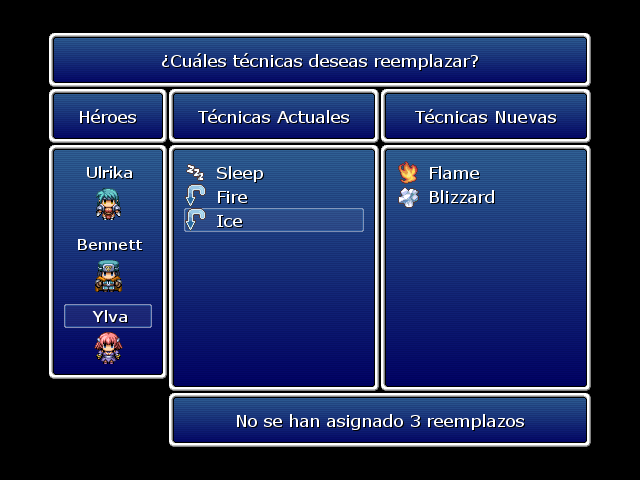 I didn't want to keep useless skills forever like in Final Fantasy 1 through 6. Still, you want to change the number of skills a hero can keep at the same time by increasing it once he or she reaches a certain level. Well, that's why you can do so via a script call. Obviously that wouldn't be automatically as you may have expected, but I'll see if I'm able to add that feature somehow. I guess I could modify the level up method and make a new Constant you could configure to define how many skills an actor can keep once they reach specific levels, levels you could also pick at will. I updated both versions a while ago so both of them should now include "the increase of maximum number of skills by leveling up" feature for sure. I hope you all like it.